What did you do to your bike today ? Topic: What did you do to your bike today ? Re: What did you do to your bike today ? Nothing on my 2 750's but took my VTX out for a leisurely run through the countryside, its been raining for the last 7 days solid here cheers Mick. My brother and I did a charity poker run yesterday, We got sidetracked today and bought 2 more bikes! a 75 750 and a 77 naked wing. Just remember there are no stupid questions, just some idiot asking them. Again went to ride and found that I have no first gear so I took apart the clutch outer cover and tightened the center screw a bit more and realized that this is in no way a solution to a clutch cable that is too long. I got out on the road only to see I couldn't shift up past 2nd gear now. New cable on the way. Road her to an Historic Bridge Park for a photo shoot. Oh that sounds pretentious! Sorry, no scantily clad sweet young thing, no professional photographer, just me, my 550 and my camera phone. damn, it was a perfect day to ride in the midwest, and my bikes sitting at work, tank off, seat off, carbs off. gotta a lot of work to do this winter, but it will be worth the wait. 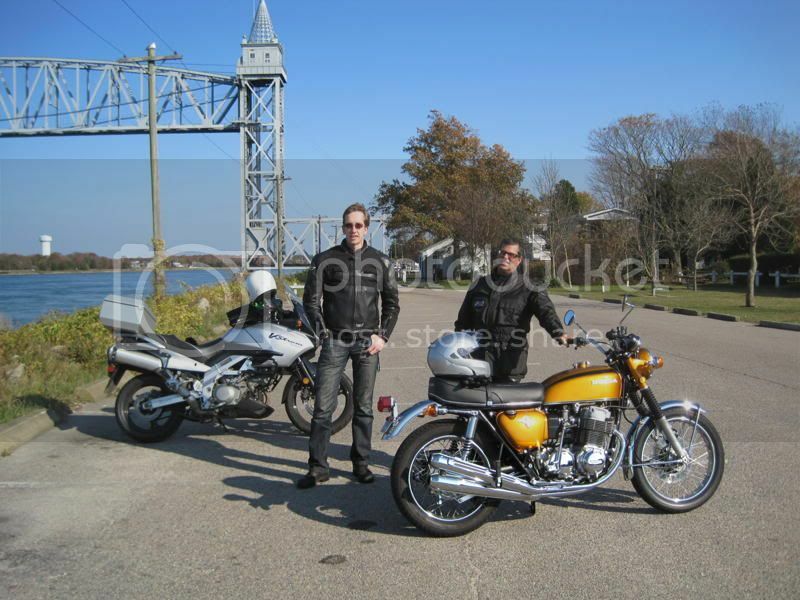 guess im waiting til next spring to post a pretty pic of me and my cb somewhere pretty. Well it's Monday morning here in Oz, and close to 100 deg F as I type this from my airconditioned office, but on Saturday I painted Al's 550 cylinder head so I can finish assembling his (now) 592cc engine, man is the port and polish work on that head beautiful, maybe the best I've seen apart from Mike Rieck's head mastery, of course. I assembled the new pistons into the rebored cylinders after one final hone, and once the paint on the head is cured, I'll install that too, with the H/D valve springs and hot cam. I also changed out the Laverda Jota handlebars on my (new) SF1 750 for some low Euro style bars which are close to the original bars, and adjusted the TLS drum brakes front and rear, and finally, I stripped and cleaned the Dellorto 36mm "pumper" carbs, and I'm happy to report that it now idles like a new one. I took it for a very quick ride as I had to take my son swimming, but when I get an hour or two, I'll take it for a longer ride, but even that short ride was great fun, and a stress reliever. Cheers, Terry. Mission accomplished! The engine is on the stand. Good day for the shop it rained all day. Do you have a copy of the Shop Manual? Today I replaced a clutch cable and a speedo cable on the CM185. Poured a bit of stabilizer into all 4 bikes and took them all for a quick boot around the neighborhood . Drained all the carbs, swept up the garage and put them away for the winter. Pushed it around back and starting to go through parts to rebuild it. I want to ride it next summer. I'll still have my GoldWings and planning a trip to Crater Lake in aug. Went on a ride with a buddy and finally got around to painting the kickstand. I just finished the engine stand adapters and painted them. Then, I soda blasted some parts in preparation for paint. The wife wasn't happy because I got baking soda all over her freshly washed Ford. A quick rinse took care of that. "The road goes on forever, but the party never ends"
Finally found time to make an aluminum thread insert for the helicoil that pulled out. Worked like a charm and I'm glad I'll get a few more rides in before the snow flies. I started taking apart the '69 CL350 I bought yesterday. What an interesting bike. Got the carbs, tank and seat off, cleaned up the exhaust a bit, pulled off the air filters (I'm pretty sure they are the original 40yo filters), checked out the tail light wiring, and other misc stuff on it. This is just the start. 1969 CL350 Scrambler... almost done!!! Well, until something else goes wrong. 2006 HD 883 Sportster, stock. No use changing it, it's still gonna be a Harley. It was a good day to be outdoors. Exceptionally warm and wonderful weekend here in southern Ohio. Today replaced a section of bar wire in the harness of my '75 750K, then worked on the horn which suddenly stopped sounding a few days ago. Between cleaning up the contact on the switch and tuning the horn with the adjustment screw, much better now. Then I headed out to visit my son and we then took off for a nice ride up the Ohio river. 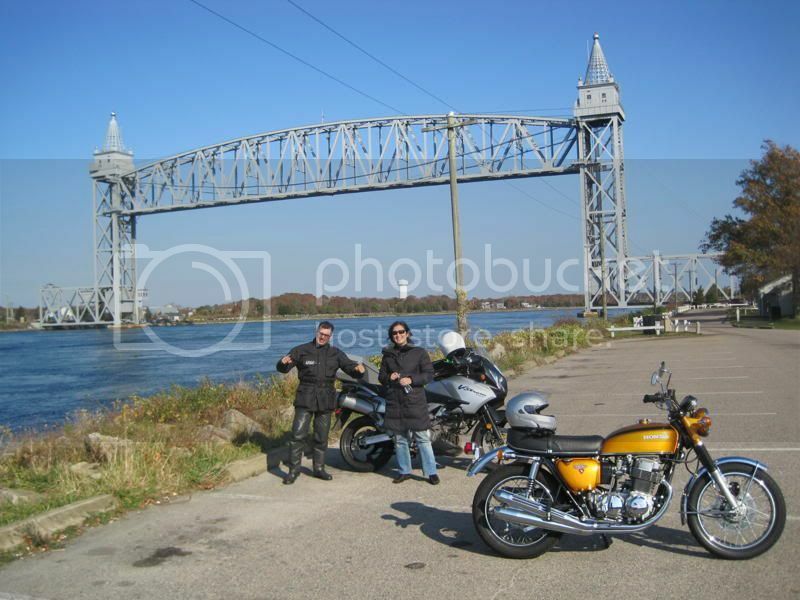 He rides a '73 BMW 75/5. Geeez, it was nice out. Nice thread here. I was feeling jealous reading messages from the guys in Cali and down south, and then felt lucky reading about the "putting up the bikes for winter" from our Canadian friends. Here in Cincinnati, we get just enough days over the winter to keep 'em running, even if the highs are in the 30's F. Never thought of that as something to feel lucky about. Life is good! Pulled the carbs of my 750 again, cleaned them out again, put them back on while getting rained on only to find out that it made no improvement to my problem. I envy all you with garages. on my 72cb750 project i assembled the front end after a full refurb over the last coupla weeks: completely stripped everything for clean/polish then checked/lubed wheel bearings, new fork seals, caliper seal, Belray 10w fork oil, cleaned/lubed odo drive, checked rim runout, etc. just starting same at the rear, stripped everything including swingarm for cleaning/checking and reass. it was a fully-equipped touring bike, but am taking off the high bars, full fairing, crash and sissy bars. will leave the Jardine turn-outs, side bags and luggage rack - sort of a honda "bagger" i guess. should be ready by spring! 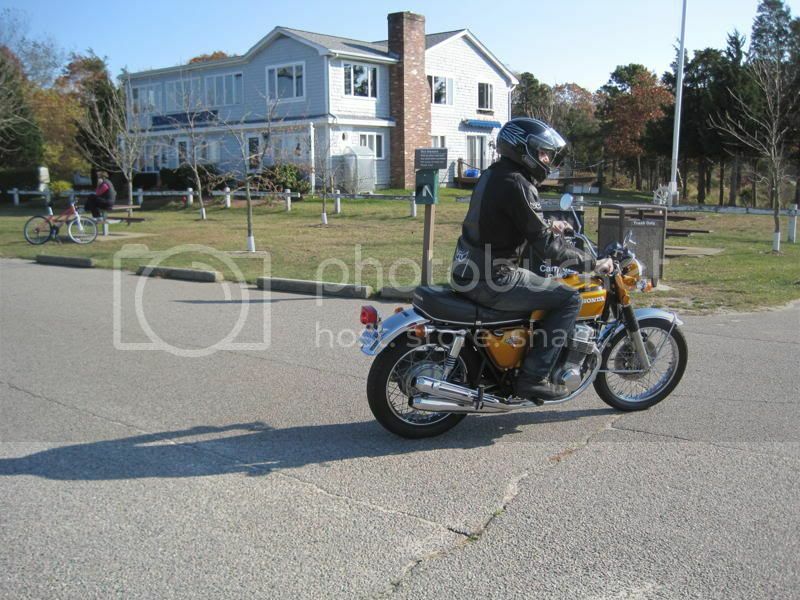 1979 gs750 --- has spark!